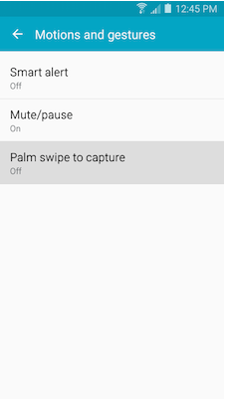 There are several ways to capture screenshots on your device. Screenshots will be copied to the clipboard and saved to the Screenshots folder in the Gallery. You can capture a screenshot by simultaneously pressing the Home key and the Power/Lock key for 1–2 seconds. Capture a screenshot by touching the screen with the side of your hand and swiping across from left to right, or vice versa. This feature is on by default, but if it has been turned off, you can follow the instructions to turn it back on. 1 From the Home screen, touch Applis. 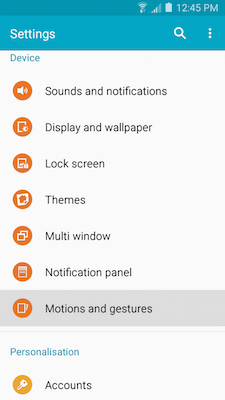 3 Scroll to and touch Motions and gestures under the Device tab. 4 Touch Palm swipe to capture. 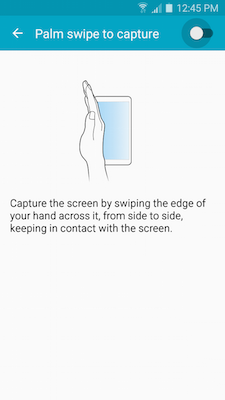 5 Touch the slider to turn Palm swipe to capture on. 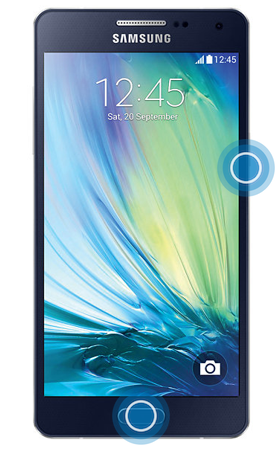 Galaxy A5: How do I use my camera from the lock screen on my Samsung Galaxy A5?